Showing 20 articles from September 30, 2013. Harley’s Bar N’ Grill opened last month in the old VFW and has something to offer for everyone- music, sports, good food, and every type of beer you could imagine! The Washington Department of Fish and Wildlife (WDFW) has tentatively scheduled razor-clam digs through October, while continuing to accept public comments on openings for the rest of the season. 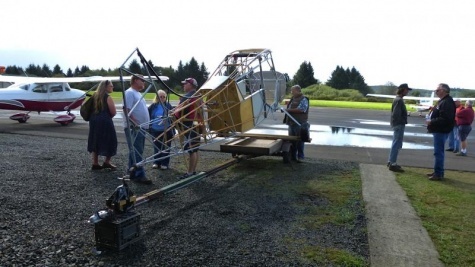 Succulent Willapa Bay oysters trumped threatening weather at the fourth annual Oyster Feed and Fly-in at the Willapa Harbor Airport Saturday, September 21. Raymond tailback Marvin So gallops for yardage against Ocosta Friday night at Seagull stadium before a huge house. The Gulls slaughtered the Wildcats 59-0 to improve to 3-1. See sports page 6. Local law enforcement agencies in Pacific County are calling Rod Run a successful event, with no major incidents to report over the weekend of events. 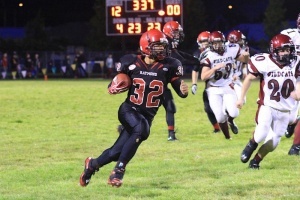 Trevor Cook throttled Naselle’s defense for 138 yards rushing and 2 touchdowns to bolt Willapa Valley past Naselle 33-15 Friday night at Crogstad Field in Menlo. I recently attended a PUD Commissioners’ meeting hoping to gain an understanding of the controversy about extending service to part of Pacific County that included Tokeland and other such areas. As of Tuesday October 1, individuals without health insurance may sign up for coverage beginning January 1, 2014 under the Accountable Care Act (ACA) as part of the Health Care Reform Act. Purple and Gold. Fight. Fight. Purple and Gold. Fight. Fight. Wait a minute, that’s my high school alma mater fight song and the new colors for the Willapa Harbor Lions Club Paper Shack, located on the Port property between Raymond and South Bend. Photo by Larry Bale...South Bend's Austin Lewis fights for yardage against Adna. 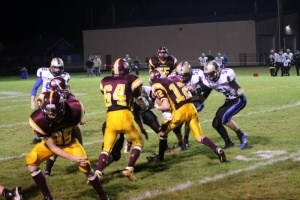 Raymond notched its second straight shutout after a 59-0 thumping of visiting Ocosta Friday before a huge home crowd. The Willapa Harbor Tri-District cross country team competed at Thousand Trails in White Pass last Saturday. Photo by Larry Bale Raymond HS senior Hannah Dykes (right) goes up to block the shot of South Bend’s Makenzie Russell last Thursday night at Koplitz Fieldhouse. At left is Alison Funkhouser. 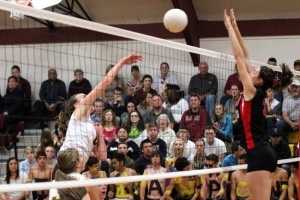 South Bend whipped Ocosta in three games 25-11, 25-8, 25-16 last Tuesday (Sept. 24) at Koplitz Fieldhouse. 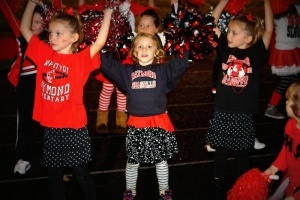 Raymond fans got a boost from their young cheerleaders who were at Friday’s game against Ocosta. Kids from kindergarten through the fifth grade were introduced at halftime. Featured at this annual event will be a traditional outdoor European 9-pinBowling Tournament that kicks off at 9 a.m. First perfect score of 27 wins $500! Bowling will continue until 8 p.m.